Mediumship | What Are The Different Kinds of Mediumship? I often tell people I am the esoteric equivalent of a “general practitioner.” A GP is a physician trained to deal holistically with the range of problems a person might have. That means they have to be familiar with a lot of different physical situations, and be able to find solutions to a patient’s problems with any number of different tools at their disposal. I’m the same way. I read Tarot and other divination decks; I can use runes and numerology; I help you connect with your spirit guides and angels, and I am a specialist with past lives. I also connect you with those who have crossed Over, and I do that as a medium. But that simple word can raise an awful lot of questions! Too many times people either (a) assume that everyone who claims to be a psychic is a Medium or (b) don’t know what a Medium is at all. This article is designed to help you learn the difference between Mediumship and other paranormal abilities. Mediumship has one overriding and important goal: to provide evidence, without doubt, of existence of life after “death” (death in this case meaning cessation of life in a body and the transition of the motivating Spirit). This is the very foundation upon which the religion of Spiritualism is founded: direct communication with the so-called “Dead.” That being the case, a Medium is, first and foremost, a bridge between two worlds. A Medium is able to send and receive information from the Spirit world, and she (or he) communicates between the life of the ‘here and now’ world and the Spirit side of life. While it is true that all of us have psychic abilities to a greater or lesser degree, successful Mediumship relies upon extremely sensitive conditions, and therefore a Medium is constantly developing and monitoring her standards of quality on a day-to-day basis. 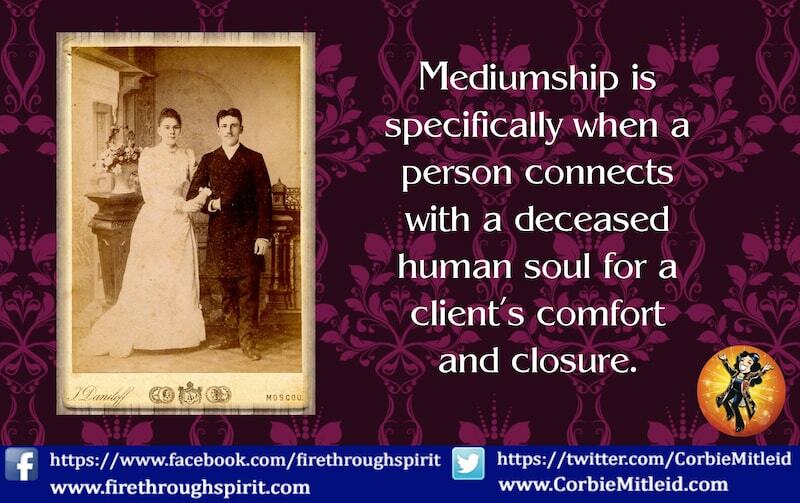 Mediumship is not cut-and-dried, because our clients aren’t either! Every reading is different, based on the personalities of the client receiving the reading, the Medium giving the reading and the Spirit or entities with whom they are working to receive the reading. Therefore, every reading or communication is a new experience for all involved, filled with the possibility of bringing exciting and important insights or messages. Before information can be completed between Medium and Spirit, there must be a bond of compatible energy between all parties involved. The Medium will need to concentrate on details and descriptions of the entity coming through; after proof of identity has been satisfied, then and only then can the Medium and the entity go on to advice or guide the client. Mediumship is not “Madame Hoohah and her Crystal Ball,” either – forget what you have seen in most movies or read in most books! There are actually several types of Mediumship, which can be divided into three major areas: Mental Mediumship, Physical Mediumship and Spiritual Healing. Physical Mediumship embraces Transfiguration, Materialization, and Trance. Transfiguration and Materialization both use ectoplasm, which is energy obtained from the Medium, other sitters, and Spirit from the world of Spirit. Ectoplasm is a substance taken from the medium’s body and according to Arthur Findlay, mixed with an etheric substance. This enables the Spirit controls to affect physical matter. Ectoplasm is extruded from the medium through any opening, very often through either the mouth, ears or nostrils. The depth or stage of Trance Mediumship depends on the circumstances that the Medium is under at the time of the trance. Spiritual Healing has the Medium/Healer raise her level of consciousness as she serves as a channel to the energies of Spirit coming through to impart healing energies to the person receiving the healing. A Medium’s training takes place on the levels of Body, Mind and Spirit as we know them. Self-discipline and self-mastery are central to such training, and governing the sensitivity of the Medium is essential. As in this world, the Spirit world has laws that come into effect when a Medium desires and reaches for the link between the two worlds. Having the gift of Mediumship does not make you an inevitable Saint – far from it! However, when one truly and with pure heart open oneself to one’s gifts of Mediumship, it means commitment to a daily growing effort, striving for the betterment of oneself in a never-ending Spiritual quest. Though sitting in chairs in a circular position is common to both events, a Development Circle is not the same as a Séance, any more than talking classes at Seminary is like going to church. It is specifically a learning place. The Circle is a gathering of people to exchange mini-readings or other such Spirit information, and is usually done in a well-lit room. Séances, conversely, are held in a dark or darkened room with the full intent and purpose of a Medium being present to utilize the energy of those gathered there to contact Spirit. In such a Séance, Spirit can come through in various ways: Independent Voice is a voice that appears to come from midair, without any ‘focus point.’ Dependent Voice occurs when Spirit creates an artificial voice box out of ectoplasm. This ectoplasmic ‘voice box’ enables them to talk to us as they once did when they lived upon the earth. The assistance of a Trumpet is often used to not only amplify the sound but also to direct to the person they wish to speak to. A Séance Trumpet is a cone of aluminum about two feet long; by making the voice box in the small end it will act as a simple megaphone and amplify the sounds. What I’ve presented here is only the very tip of the iceberg. 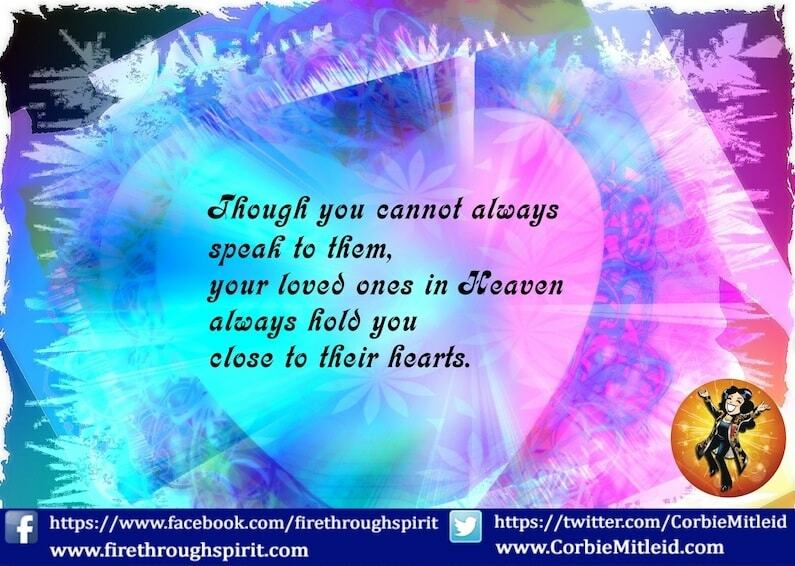 Spiritualism and Mediumship are real, viable and a central part of life for thousands of people worldwide.